The Therm-A-Sleep Snow Pillow features a combination of cooling fabric and hybrid fill for responsive support and comfort. Unique hybrid design combines low tension springs with hypoallergenic down alternative fill. Nordic Chill fiber provides a cool-to-the-touch feel, while transporting heat away from the sleeper 10x more quickly than cotton. Cooling effect works even through thick pillowcases. Added Tencel fibers are smooth for sensitive skin, and hypoallergenic, moisture-wicking, and inhibit bacteria growth. Multiple levels of firmness are perfect for side, back and stomach sleepers. Machine-washable construction is easy to clean and maintain. 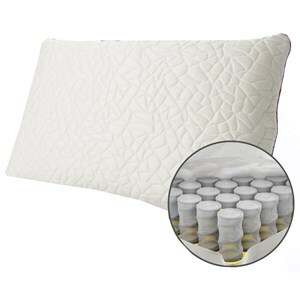 The Snow Classic Hybrid Cooling Pillow Queen Snow FIRM Cooling Pillow, Hybrid Down Alternative Fill with Pocket Coils by Protect-a-Bed at Value City Furniture in the New Jersey, NJ, Staten Island, Hoboken area. Product availability may vary. Contact us for the most current availability on this product. The Snow Cooling Pillow, Hybrid Down Alternative Fill with Pocket Coils, provides a supportive pillow with pocketed coils and down alternative fill. Available in firm, medium and soft. The Nordic Chill fiber provides a cool-to-the-touch feel, while transporting heat away from the sleeper. The Snow Classic Hybrid Cooling Pillow collection is a great option if you are looking for Mattresses in the New Jersey, NJ, Staten Island, Hoboken area. Browse other items in the Snow Classic Hybrid Cooling Pillow collection from Value City Furniture in the New Jersey, NJ, Staten Island, Hoboken area.